Many a time the phrase “Unity is strength” and the “Power of team-work” is over-emphasized. But how many times does the reality of it dawn on us so powerfully? A story is told: “A father had a family of sons. Unfortunately they weren’t very nice to one other. There was constant quarreling and bickering. No matter what the Father said to his sons, it didn’t do any good. As a result, he thought long and hard about what he could say or do. He wanted to provide them with a lesson that would help them realize the impact that their constant quarreling would ultimately have. One day the quarreling became more aggressive and even turned violent. The father broke it up and sent each son to a different corner of the yard. It was at that point that this wise Father came up with a lesson. He sent one of the sons to bring him a bundle of sticks. He tied the bundle of sticks and asked each son to take turns in trying to break them. Each of them tried very hard, but couldn’t come close to snapping the bundle. 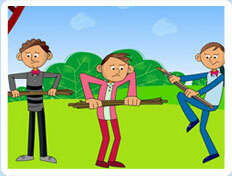 The father then untied the bundle and gave each son one stick and asked them to break it now. They did so easily.